Back in the 1990s, France was ruled by mostly leftwing successive governments. When they tried to make even the slightest change to any labor laws, the truckers, railway workers and farmers would strike and block the country’s oil refineries and highways, holding on for a week or so until the whole republic was thrown into chaos and the government had no choice but to let go of its new regulation. The images from people looking desperately for fuel in the 1990s during these strikes are legendary in Europe. France was a laughing stock and vowed to clean up its act. The last few weeks, it is possible that the farmers have heard about the Brazilian trucker’s strike, which might have served as a throwback to those times. In order to do their part in the three-month-long rail and public sector strike which is trying to get the government to hold off on labor reforms, the farmers have as of this morning, blocked the major oil refinery depots as they protest palm oil imports by the country’s biggest oil company, Total. The strike will continue to sour relations between what is still the EU’s biggest agricultural sector and the government of President Emmanuel Macron, who had vowed to assure fairer prices for the farmers. 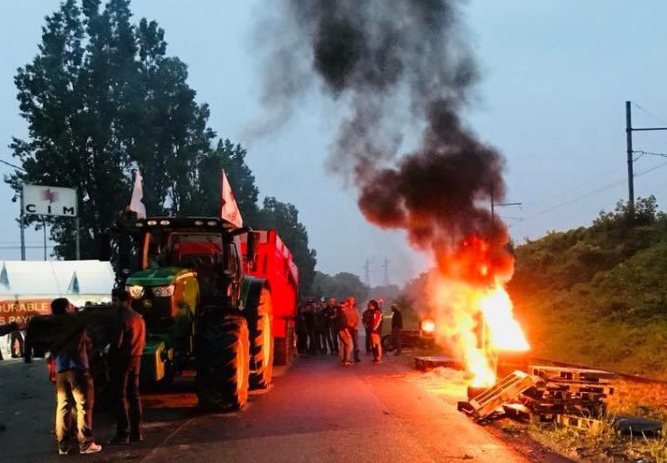 Agricultural Minister Stephane Travert called on the farmers to return to their homes as he declared the blockades to be ‘illegal.’ 18 oil refineries across France were blocked as of Monday morning. Communist stop strikes. Stop importing rapugees to help with the budget. Socialism keeps on failing once the seed is planted the GIVE ME's will keep demanding more. Again, again and again.